dolls on parade, originally uploaded by jahansell. 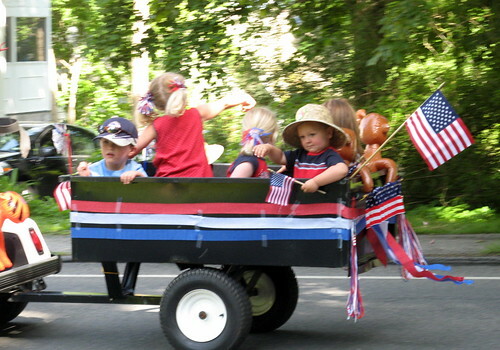 The cute kids are not the point of the parade - the veterans are. But this picture was so cute and so representative of our wonderful local parade that I couldn't resist making it the main photo of the day. There were veterans, firemen and fire trucks, local teams and scouting troops, and lots of vintage cars and other cool vehicles. I don't know why, exactly, (are we supposed to remember the cars of days gone by? If so, I remember you, '76 Chevy Impala that died on the Lodge Freeway when I forgot to check the oil!) but it makes for a longer and more festive parade! Hi Jenny! Yes, this is a more festive Memorial Day post than the rest of us have posted today, but it's a welcome respite from the reminder of wars and death. The children are so innocently happy! Good shot! !